The Large Hadron Collider (LHC), located at the CERN laboratory near Geneva, provides the highest energy proton-proton collisions, currently at a center of mass energy of 13 TeV. 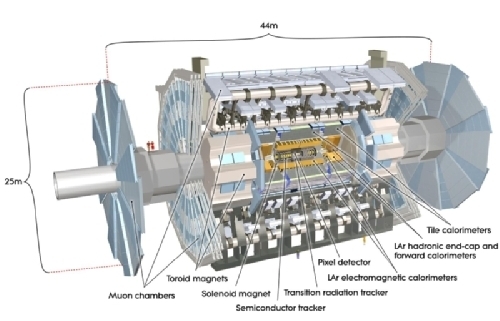 The ATLAS Collaboration constructed and operates a large detector, located on the LHC ring, to detect and record the products of the proton collisions. The LHC and the ATLAS detector together form the most powerful microscope ever built, allowing scientists to explore space and time, and the fundamental laws of nature, to unprecedented levels. Central goals of the ATLAS experiment are the search for the Higgs boson, a particle predicted to be linked to the mystery of the origin of mass at a fundamental level, and the search for physics beyond the Standard Model of particle physics, such as supersymmetry or extra spatial dimensions. On July 4th 2012 the ATLAS Collaboration announced the discovery of a new particle, a boson consistent with the sought-after Higgs boson; on October 8th 2013 the Nobel Prize in Physics was awarded to Prof. Englert and Prof. Higgs. VISPA scientists are founding members of the ATLAS Collaboration, and participated in the design and construction of the ATLAS detector. The UVic group is currently composed of over 25 scientists, including students, research associates, technicians, computer experts, engineers and physics professors. Since 1992, the ATLAS project at UVic provides unique opportunities for the training of highly qualified personnel; many former UVic-ATLAS members now hold permanent positions in top institutions in Canada and abroad. The VISPA-ATLAS team benefits from its close relation with TRIUMF, Canada's National Laboratory for Particle and Nuclear Physics. Dr. Rob McPherson, professor of Physics at UVic and Research Scientist at the Institute of Particle Physics of Canada, was Deputy Spokesperson of the ATLAS Collaboration for two years until end of February 2017. The UVic-ATLAS group is engaged in many ATLAS activities. Click below to expand. UVic scientists have contributed to ATLAS data analyses since the first LHC collisions in 2010, and are currently involved in a variaty of data analyses. Constraints on mediator-based dark matter models using √s = 13 TeV pp collisions at the LHC with the ATLAS detector. Submitted to JHEP 2019/03/03. Constraints on off-shell Higgs boson production and the Higgs boson total width in ZZ→4ℓ and ZZ→2ℓ2ν final states with the ATLAS detector, Phys. Lett. B. 786 (2018) 223. Submitted 2018/08/03. Search for new phenomena using the invariant mass distribution of same-flavour opposite-sign dilepton pairs in events with missing transverse momentum in √s = 13 TeV pp collisions with the ATLAS detector, Eur. Phys. J. C (2018) 78: 625. Submitted 2018/05/29. Search for heavy ZZ resonances in the ℓ+ℓ−ℓ+ℓ− and ℓ+ℓ−νν¯ final states using proton–proton collisions at √s = 13 TeV with the ATLAS detector, Eur. Phys. J. C (2018) 78: 293. Submitted 2017/12/18. Measurement of the Higgs boson coupling properties in the H → ZZ* → 4ℓ decay channel at √s = 13 TeV with the ATLAS detector, J. High Energ. Phys. (2018) 2018: 95. Submitted 2017/12/06. Measurement of the Drell-Yan triple-differential cross section in pp collisions at √s = 8 TeV, the ATLAS collaboration, J. High Energ. Phys. (2017) 2017: 59. Submitted 2017/10/14. Search for an invisibly decaying Higgs boson or dark matter candidates produced in association with a Z boson in pp collisions at √s = 13 TeV with the ATLAS detector, Phys. Lett. B 776 (2017) 318. Search for new phenomena in events containing a same-flavour opposite-sign dilepton pair, jets, and large missing transverse momentum in √s = 13 TeV pp collisions with the ATLAS detector, Eur. Phys. J. C (2017) 77: 144. Submitted 2016/11/17. LHC Dark Matter Working Group: Next-generation spin-0 dark matter models, CERN-LPCC-2018-02. Submitted 2018/10/22. Search for new light gauge bosons in Higgs boson decays to four-lepton final states. The ATLAS Collaboration was founded in 1992, and includes the University of Victoria as one of its founding institutes. The UVic-ATLAS group was led by Prof. Michel Lefebvre, and included Prof. Alan Astbury and Prof. Richard Keeler. Prof. Lefebvre was the founding Spokesperson of the ATLAS-Canada Collaboration, founded in 1992 with colleagues from the Université de Montréal. The UVic-ATLAS group has been growing, and now also includes Dr. Justin Albert, Prof. Robert Kowalewski, Prof. Robert McPherson, Prof. Randy Sobie, and Dr Isabel Trigger (TRIUMF). Both McPherson and Sobie are Institute of Particle Physics Scientists. Prof. McPherson has been the Principal Investigator of the ATLAS-UVic group from 2003 to 2015, and was Spokesperson of the ATLAS-Canada Collaboration from 2007 to 2015; he was appointed Deputy Spokesperson of the ATLAS Collaboration for two years starting February 2015. Prof. Lefebvre acted as the Principal Investigator of the ATLAS-UVic group from 2015 to 2018; Prof. McPherson is Principal Inverstigator of the ATLAS-UVic group since April 2018. The particle physics expertise at UVic goes hand in hand with its close relation with TRIUMF, Canada's National Laboratory for Particle and Nuclear Physics. TRIUMF staff located at UVic played crucial roles in the construction of the ATLAS experiment. Canadian involvement in ATLAS and the LHC has placed us in a prominent position in the forefront international science project of the decade. In total Canada has invested $70 million of the $8 billion total in equipment that is now a crucial part of the CERN LHC accelerator complex and the ATLAS particle physics experiment. Canadian researchers have received an additional $30 million to fund graduate students, postdoctoral researchers and their research on ATLAS. TRIUMF has provided staff and technical support to make these contributions a reality. As a result of these investments and the resulting scientific and technical expertise Canada is a respected partner at CERN and in the international science community. No single country could afford to build the $8 billion LHC project on its own. ATLAS has been built by researchers from more than 150 universities and laboratories in 35 countries. 150 Canadian scientists (faculty, lab staff, postdoctoral researchers and graduate students) from eleven institutions across the country work at CERN, alongside 2000 other scientists from every corner of the globe, on the ATLAS experiment. Canada has made important contributions to the LHC, ATLAS and the world-wide computing grid now digesting the ATLAS data. In 1995 TRIUMF was given the mandate to act as Canada's main connection with CERN. It was provided with $42 million of federal funding over ten years to develop and construct components for the LHC. These projects were completed on time and in budget in close collaboration with Canadian industry. Over 90% of our LHC funding has been spent in Canada. There have been a number of spin-offs from this activity. I.E. Power, Inverpower and Digital Predictive Systems in Ontario gained expertise in high current power supply design and fabrication and have competed successfully for an additional $10M in contracts from major international labs. ALSTOM-Canada, in Tracy, Quebec improved assembly tolerances for LHC magnets benefiting their main business, the fabrication of hydro generators. Canadians were instrumental in the construction of the ATLAS detector. ATLAS construction was supported by a $12 million grant from the Natural Sciences and Engineering Research Council of Canada (NSERC). Canadian contributions to the ATLAS detector were completed on time and on budget, are now installed in the ATLAS experiment where they are currently successfully used to record the LHC collisions. When taking data, ATLAS produces several Peta-bytes (millions of Giga-bytes) of data per year. Canada has constructed a Tier1 computing centre at TRIUMF funded by the Canadian Foundation for Innovation (CFI) and the BC Knowledge Development Fund (BCKDF) at the levels of $12 million and $4 million, respectively. The primary role of the Tier1 centre is the processing of raw ATLAS data which will be used by physicists to understand what is going on in the high energy proton collisions. The final analyses will be performed largely on the Tier 2 computing centres located at university sites, funded by the CFI National Platforms Fund. The combined Canadian Tier1 and Tier2 centres give us "made in Canada" physics analysis ability, positioning ourselves to be leaders in extracting ATLAS physics over the coming years. The UVic-ATLAS group is currently composed of over 25 scientists, including students, research associates, technicians, computer experts, engineers and physics professors. Since 1992, the ATLAS project at UVic provides unique opportunities for the training of highly qualified personnel. Many former UVic-ATLAS members now hold permanent positions in top institutions in Canada and abroad. The UVic-ATLAS group has made crucial contributions to the design, development and construction of the ATLAS detector since 1992. UVic's contributions focused on detector components, called calorimeters, specialized in the measurement of the energy of particles. The chosen technology features liquid argon as active medium, and makes use of a novel geometrical design optimized in part at UVic. From 1992 to 2004 UVic scientists participated in the prototyping of calorimeter detectors, in the testing of these detectors with particle beams, and in the construction of the final full size ATLAS components. Since liquid argon is very cold, about -188 degrees Celsius, the calorimeters must be enclosed in purpose-built cryostats. A critical component of such cryostats are its cryogenic feedthroughs, which allow nearly 200,000 electrical signals from the calorimeters to reach the outside world. Most of these feedthroughs were constructed in UVic between 1997 and 2002, with the support of an $4.0M NSERC Major Installation Grant. Members of the UVic team spent considerable time at CERN integrating these components on the final ATLAS detector. From 2005 to 2009, the UVic-ATLAS group was heavily involved in the final preparation of the detector leading to first collisions. This commissioning work involved the testing of aspects of the ATLAS detector. UVic scientists developped and maintained computer software and methods that are used to monitor the detector operations, and to ensure that the recorded data is of the highest quality. UVic scientists also developed strategies and software for the analysis of the collisions. Since 2010, UVic scientists are actively analyzing the data collected at the LHC, and particlpated in the discovery of a Higgs boson. Analyses involve Standard Model and Higgs boson measurements, and searches for new phenomena such as supersymmetric particles, or evidence for Dark Matter. UVic scientists also contribute to the operation of the ATLAS detector, in particlular the operation of the liquid argon calorimetry and the development and operation of the ATLAS high level trigger, and to the upgrade of the ATLAS liquid argn calorimeter electronics and the new muon small wheel. A Memorial Symposium in honour of our colleague Prof. Alan Astbury (1934-2014) was held at UVic the 27-28 of April 2015 and featured a public talk by the Director General of CERN, Dr Rolf Heuer; this talk was the first of the Astbury Public Lecture series. Kayla McLean, "Search for dark matter candidates produced in Z(ll)+ETmiss events with the ATLAS detector at the LHC", The puzzle of dark matter: assembling the pieces, DESY, Hamburg, Germany, 29-31 October 2018. Kenji Hamano, "ATLAS rare and BSM decays", Higgs Hunting 2018, Orsay and Paris, France, 23-25 July 2018. Frank Berghaus, "Sim@P1: Using Cloudscheduler for offline processing on the ATLAS HLT farm", CHEP2018, Sofia, Bulgaria, 9-13 July 2018. Justin Chiu, "Search for Higgs boson decays to BSM light bosons in four-lepton events with the ATLAS detector in 2015-6 and -17", CAP2018, Halifax, Canada, 11-15 June 2018. Richard Keeler, "Measurement of the Drell-Yan triple-differential cross section", CAP2018, Halifax, Canada, 11-15 June 2018. Kayla McLean, "Search for dark matter candidates produced in Z(ll) + ETmiss events in 13 TeV pp collisions with the ATLAS detector at the LHC", CAP2018, Halifax, Canada, 11-15 June 2018. Christopher Anelli, "Readout electronics upgrades of the ATLAS liquid argon calorimeter", PM2018, Elba, Italy, 27 May - 2 June 2018. Monica Trovatelli, "Measurement of cross sections and properties of the Higgs boson in decays to bosons using the ATLAS detector", DIS2018, Kobe, Japan, 16-20 April 2018. Christopher Anelli, "Dark Matter Searches in the Z(ll) +MET channel", DM@LHC2018, Heidelberg, Germany, 3-6 April 2018. Christopher Anelli, "Dark Matter searches at the LHC", DMStat2018, Banff, Canada, 25 February - 2 March. Rob McPherson, "ATLAS at the LHC: status and recent results", Plenary talk, Lepton-Photon 2017, Guangzhou, China, 7-12 August 2017. Alison Elliot, "Dark Matter Searches with the ATLAS detector", QFTHEP'2017, Yaroslavl, Russia, 26 June - 3 July 2017. Emma Kuwertz, "Operation & Performance of the ATLAS Detector", CAP2017, Kingston, Canada, 28 May - 2 June 2017. Randy Sobie, "HEPNET and HEP Computing", CAP2017, Kingston, Canada, 28 May - 2 June 2017. Kenji Hamano, "Invisible Higgs", ATLAS+CMS talk, DM@LHC2017, Los Angeles, USA, 3-5 April 2017. Emma Kuwertz, "Pushing limits on generic squarks and gluinos with 13 TeV data", Moriond Electroweak, La Thuile, Italy, 18-25 March 2017. Christopher Anelli, "Quartic Gauge Boson Coupling Results from the LHC", WNPPC2017, Banff, Canada, 16-19 February 2017. Alison Elliot, "Search for Dark Matter with Leptonically-decaying Z bosons and Missing Transverse Energy in the ATLAS Detector at the LHC", WNPPC2017, Banff, Canada, 16-19 February 2017. Graeme Niedermayer, "Investigations of calorimeter clustering at ATLAS using machine learning", WNPPC2017, Banff, Canada, 16-19 February 2017. Randy Sobie, "Clouds in High Energy Physics", Plenary talk, CHEP2016, San Francisco, USA,10-14 October 2016. Randy Sobie, "Middleware, Monitoring and Accounting", Plenary talk, summary of Track 7, CHEP2016, San Francisco, USA, 10-14 October 2016. Rolf Seuster, "Context-aware distributed cloud computing using CloudScheduler", CHEP2016, San Francisco, USA, 10-14 October 2016. Randy Sobie, "Clouds at other sites: T2-type computing", WLCG workshop (held just before and in conjunction with CHEP2016), San Francisco, USA, 8-9 October 2016. Monica Trovatelli, "Search for invisible decay modes of the Higgs boson with the ATLAS detector", ICHEP2016, Chicago, Illinois, USA, 3-10 August 2016. Ewan Hill, "Search for direct top squark pair production in events with two tau leptons with the ATLAS detector", CAP2016, Ottawa, 13-17 June 2016. Rob McPherson, "ATLAS@LHC: status and recent results", Plenary talk, HEP2016, Thessaloniki, Greece, 12-14 May 2016. Kenji Hamano, "Latest results from the mono-X channels", ATLAS+CMS talk, DM@LHC2016, Amsterdam, Netherlands, 30 March - 1 April 2016. Justin Chiu, "Performance and Implementation of the ATLAS Missing Transverse Momentum Trigger in Run-2", WNPPC2016, Banff, Canada, 11-14 February 2016. Alison Elliot, "Search for Dark Matter Through Signatures with Leptonically-decaying Z bosons and Missing Transverse Energy in the ATLAS Detector at the LHC: 2015 Discovery Prospects", WNPPC2016, Banff, Canada, 11-14 February 2016. Tony Kwan, "Measurement of Neutral-Current Drell-Yan Production in Proton-Proton Collisions at 8 TeV with the ATLAS Detector", WNPPC2016, Banff, Canada, 11-14 February 2016. Kayla McLean, "Search for Dark Matter Through Signatures with Leptonically-decaying Z bosons and Missing Transverse Momentum in the ATLAS Detector: Signal Models and Systematics", WNPPC2016, Banff, Canada, 11-14 February 2016. Claire David, "Search for supersymmetry with the ATLAS detector in final states with leptons, jets and missing transverse momentum", Lake Louise Winter Institute, Alberta, Canada, 7-13 February 2016. Alison Elliot, "Searches for resonant and non-resonant new phenomena from ATLAS", QCD@LHC2015, London, UK, 1-5 September 2015. Manuela Venturi, "Higgs boson properties at the LHC: mass, spin, and parity", LHCP2015, Saint Petersburg, Russia, 31 August - 5 September 2015. Emma Kuwertz, "Supersymmetry searches in ATLAS", ICNFP2015, Crete, Greece, 22-30 August 2015. Matt LeBlanc, "Tagging boosted top quarks and Higgs bosons in ATLAS", BOOST2015, Chicago, USA, 10-14 August 2015. Ewan Hill, "SUSY searches with ATLAS", QFTHEP'2015, Samara, Russia, 24 June - 1 July 2015. Proceedings. Manuela Venturi, "Measurement of the Higgs boson properties with the ATLAS experiment", CAP2015, Edmonton, Canada, 15-19 June 2015. Monica Trovatelli, "Prospects for future precision measurements of Higgs properties at HL-LHC", WIN2015, Heidelberg, Germany, 8-13 June 2015. Tony Kwan, "Measurements of Drell-Yan transverse momentum and vector boson plus jets properties with the ATLAS detector", DIS2015, Dallas, Texas, USA, 27 April - 1 May 2015. Michel Lefebvre, "The discovery of the Higgs boson", Alan Astbury Memorial Symposium, Victoria, Canada, 27-28 April 2015. Emma Kuwertz, "Searches for supersymmetry in events containing a Z boson, jets and missing transverse momentum", NExT2015 Workshop, UCL, London, 29 April 2015. Ryan Taylor, "The evolution of cloud computing in ATLAS", CHEP2015, Okinawa, Japan, 13-17 April 2015. Kenji Hamano, "Search for Exotics and Higgs physics beyond the Standard Model with the ATLAS detector", Plenary talk, Kruger2014, South Africa, 1-6 December 2014. Christopher Marino, "Searches for non-SUSY Exotics in ATLAS", SUSY2014, Manchester, UK, 21-26 July 2014. Florian Bernlochner, "Higgs production with jets and with jet vetoes", JVMO2014, Durham, UK, 16-18 July 2014. Florian Bernlochner, "Review of the current status of Higgs Properties", CAP2014, Sudbury, Canada, 16-20 June 2014. Kenji Hamano, "Search for new physics in the samesign dilepton final states with ATLAS detector", CAP2014, Sudbury, Canada, 16-20 June 2014. Florian Bernlochner, "Combined measurements of the Mass and Couplings Properties of the Higgs boson & Differential cross sections of the Higgs boson measured in the diphoton decay channel using the ATLAS Detector", PASCOS2013, Taipei, Taiwan, 20-26 November 2013. Christopher Marino, "Upgrade of the Trigger Readout System of the ATLAS Liquid Argon Calorimeters", 14th ICATPP, Como, Italy, 23-27 Septembre 2013. James Pearce, "Dark matter searches - with focus on new techniques", ATLAS+CMS talk, WIN2013, Natal, Brazil, 16-21 Septembre 2013. Michel Lefebvre, "W and Z bosons + jets with CMS and ATLAS", Plenary talk, QCD@LHC2013, DESY, Hamburg, Germany, 2-6 Septembre 2013. Claire David, "New ATLAS results in SUSY searches for 3rd generation squarks and ElectroWeak production", ICNFP2013, Kolymbari, Crete, Greece, 28 August - 5 September 2013. Proceedings will be published in EPJ Web of Conferences vol. 71. Michel Lefebvre, "Discovery at the Large Hadron Collider", Opening Plenary talk, CAP2013, Montréal, Canada, 27-31 May 2013. James Pearce, "Monojet Search for new phenomena with the ATLAS detector", CAP2013, Montréal, Canada, 27-31 May 2013. Randy Sobie, "Clouds in High Energy Physics", OpenStack Summit, Portland, USA, 15-18 April 2013. Michel Lefebvre, "Subatomic Smash", 50th Anniversary Signature Event, University of Victoria, Victoria, Canada, 9 April 2013. Video link. Ryan Taylor, "Adding IaaS Clouds to the ATLASComputing Grid", ISGC2013, Taipei, Taiwan, 17-22 March 2013. Eric Ouellette, "Higgs in ATLAS", Lake Louise Winter Institute, Lake Louise, Canada, 17-23 Febraury 2013. Frank Berghaus, "Search for Quark Substructure in 7 TeV ppCollisions with the ATLAS Detector", CAP2012, Calgary, Canada, 11-15 June 2012. Alex Martyniuk, "Search for a heavy Higgs boson at ATLAS", PLHC2012, Vancouver, Canada, 4-9 June 2012. Christopher Marino, "Search for Long-Lived Massive Particles with the ATLAS Detector", Pheno2012, Pittsburgh, USA, 7-9 May 2012. Alex Martyniuk, "Searches for the Higgs Boson with ATLAS", Pheno2012, Pittsburgh, USA, 7-9 May 2012. Michel Lefebvre, "Overview of ATLAS: Experiment and Results", TRIUMF Workshop on LHC Results, Vancouver, Canada, 14-16 December 2011. Michel Lefebvre, "Performance of Jets and Missing Transverse Energy with the ATLAS Detector in pp Collisions at √s = 7 TeV", LHC Days in Split, Croatia, 4-9 October 2010. Frank Berghaus, "Federating distributed storage for clouds in ATLAS", ACAT2017, Seattle, 21-25 August 2017. Rolf Seuster, "Enabling research network connectivity to clouds with virtual router technology", CHEP2016, San Francisco, 10-14 October 2016. Ryan Taylor, "Consolidation of cloud computing in ATLAS", CHEP2016, San Francisco, 10-14 October 2016. Emma Kuwertz, "ATLAS liquid argon calorimeter performance in Run 1 and Run 2", LHCP2016, Lund, Sweden, 13-18 June 2016. Jessica Strickland, "Machine Learning — Multivariate Analysis with Boosted Decision Trees", CERN Summer Student poster session, CERN, 6 August 2014. Claire David, "Search for chargino and neutralino production with a Higgs boson in the decay chain in 1 or 3 leptons final state events with ATLAS", ICHEP2014, Valencia, Spain, 2-9 July 2014. Claire David, "Search for charginos, neutralinos and sleptons in 1 or 2 leptons final state events with ATLAS", 117th LHCC Meeting, CERN, 5-6 March 2014. Claire David, "Search for Higgs production in supersymmetric decay cascades with the ATLAS detector", TRIUMF International Review Committee, Vancouver, Canada, 14 Novembre 2013. Vikas Bansal, "Search for Contact Interactions in Dilepton Events at √s = 7 TeV with the ATLAS Detector", PLHC2012, Vancouver, Canada, 4-9 June 2012. Proceedings. Christopher Marino, "Search for Long-Lived Exotic Particles with the ATLAS Detector", PLHC2012, Vancouver, Canada, 4-9 June 2012. Proceedings. Ewan Hill, "The Cosmic Muon Intensity in the ATLAS Detector at the Large Hadron Collider", CAP2012, Calgary, Canada, 11-15 June 2012. Margret Fincke-Keeler, "Upgrade Plans for the ATLAS Forward Calorimetry for the HL-LHC", XII Pisa Meeting on Advanced Detectors, Elba, Italy, 20-26 May 2012. Michel Lefebvre et al., "Signal Feedthroughs for the ATLAS Liquid Argon Calorimeters", TRIUMF BOM Meeting, Victoria, Canada, 17 November 2011. ATLAS Masterclass 14 April 2018, UVic. Conférence Alliance Française, "À la recherche des composantes fondamentales de l'univers", Prof. Michel Lefebvre, Victoria, 17 March 2018. ATLAS Masterclass 8 April 2017, UVic. Café Scientifique, "The discovery of the Higgs boson and exploration at the Large Hadron Collider", Prof. Michel Lefebvre, sponsored by UVic Faculty of Science, Hermann's Jazz Club, 10 January 2017. About 125 people in attendance. "ATLAS data sonification: a new interface for musical expression and public interaction", Ewan Hill, Poster presented at ICHEP2016, Chicago, 3-10 August 2016. Proceedings. "Musician and Mega-Machine: Compositions Driven by Real-Time Particle Collision Data from the ATLAS Detector", Ewan Hill et al, NIME 2016, Proceedings of the 2016 International Conference on New Interfaces for Musical Expression, pages 78-83, 12 July 2016. "Quantizer: high energy physics experienced through real-time audio". Ewan Hill et al., launched 20 May 2016. "Sonification Platform for Interaction with Real-Time Particle Collision Data from the ATLAS Detector", Ewan Hill et al, CHI EA '16, Proceedings of the 2016 CHI Conference Extended Abstracts on Human Factors in Computing Systems, pages 1647-1653, 7 May 2016. 2nd Alan Astbury Memorial Lecture, "The Long Road to the Higgs boson and Beyond", UVic, Prof. Sir Tejinder Singh Virdee, FRS, Imperial College, London, 26 April 2016. About 350 people in attendance. ATLAS Masterclass April 2016, UVic. Café Scientifique, "Exploration at the Large Hadron Collider", UVic, Prof. Michel Lefebvre, sponsored by the General Consulate of France in Vancouver, in partnership with the University of Victoria, the Alliance Française and the Association Français du Monde, 14 March 2016. About 75 people in attendance. "The Sound of Science: Sonification of ATLAS events", Ewan Hill, 28 September 2015. Inaugural Alan Astbury Memorial Lecture, "Breaking the wall of the hidden universe - what the discovery of the Higgs boson tells us about Physics, Mankind and the Universe", UVic, the Director General of CERN, Dr. Rolf Heuer, 27 April 2015. About 400 people in attendance. ATLAS Masterclass April 2015, UVic. ATLAS Masterclass April 2014, UVic. Public lecture, UVic 50th Anniversary Signature Event, Subatomic Smash: "The Quest for the Higgs Boson", UVic, Prof. Michel Lefebvre, 9 April 2013. About 500 people in attendance. ATLAS Masterclass April 2013, UVic. Café Scientifique, "The Search for the Higgs particle at the Large Hadron Collider", Prof. Michel Lefebvre, sponsored by UVic Faculty of Science, Hermann's Jazz Club, 12 March 2013. About 150 people in attendance. ATLAS Masterclass April 2012, UVic.